Maruti said in late 2015 that it was going to launch all new products in the market and the world wondered what could it be. Slowly and steadily the reply came in the form of the Brezza, Baleno S-Cross and now this, the Ignis. All cars have the formidable rivals in its category and so does the Ignis. The manufacturer being the largest and strongest in the country found a way to bypass all of that and make sure that it stands out at the same time. Suzuki engineering and Maruti packaging saw the companies post record sales for all of its products. Ignis is all set to do the same as it is ready to top the sales chart because it offers everything to everybody. Right from cosmetic options to mechanical bits which includes an array of options. 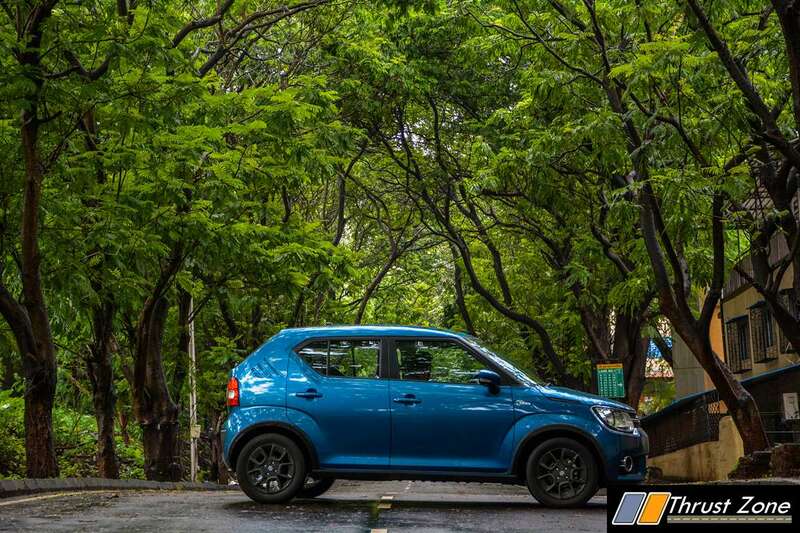 We begin to test the Ignis with the diesel AMT and we have something interesting to say about it. Let’s find that out now. When it comes to the styling, the car has a very captivating front end with a large grill, headlights merged in the same area from one to the other which is the highlight of the car. Even the lower bumper area has gaping area along with large fog lamps with chrome surrounds that help it stand out. The neat integration of flared wheel arches with slim wheels and tyres is a bit odd for a car with high level sporty credentials but then again, it is a sub four meter car with hatchback sized engines under the hood. Side profile is spot on and the C-Pillar has the WiFi alike logo which is the highlight. However, from there onwards, our team noted that the car ends rather abruptly and the rear end was forced to look busy with cuts and creases along with boxy tail-lamps to make it fit in a sport package that the rest of the car has. Needless to say with color and roof combinations and endless accessories to choose from, the car just continues to wow you with its cosmetic appeal. Interior has a very clean layout but yet it feels very sporty. The flat and low mounted dashboard with vents in the lower part which is quite slim and also houses the infotainment system in the middle which sticks out in this AMT mid-spec variant. Carbon fibre inserts around the vents adds to the sporty appeal. The steering wheel is all new and so is the new instrument cluster which is simple and yet racy at the same time. Quality all around is extremely commendable this time. Fit-finish is also well done. We wish Suzuki finally gets second generation switches for all its car as they have become a eye sore lately. Lower half has A/C controls and below a large stowage area which has cup holders. That area on the outside comes with exterior body color which lifts the ambiance dramatically. Glovebox is very large and door bins are cramped but they can hold bottles if you force them enough. We like the covers for the AUX and USB outputs which look great for some odd to reason to us. A fine attention to detail factor we guess is what makes it look great. Infotainment system has Bluetooth and a non-touch screen unit which can be seen on manual top-end variants while the rest of the variants gets this screen as standard. Bluetooth can be fiddly in the beginning after which it should be just fine everyday. Parking sensors, keyless entry- start-stop, electric ORVM are on offer and so are fog lamps on the mid-spec variant. Ignis has a complete MID on offer for fuel-efficiency parameters which can be accessed from the Info button on the steering and behind the steering wheel, which is on the dashboard. Space in the back is adequate in every area such as head, shoulder and knee room. Thigh support is also decent. Boot space of 246 litres makes it quite a versatile car. Visibility all around though is fantastic and it gives a sense of airiness to all its occupants. Legroom in the front also is quite generous and aids in comfort. Dead pedal in our AMT car is also spacious enough for big foots. Overall one of the plus points of the Ignis reside here, in the interior as well. We are witnessing the 75 PS diesel 1.3 l Multijet motor once again in the Ignis but it comes mated to an AMT gearbox here. Maruti and even other AMT gearboxes from other manufacturers are not the best when it comes to offering smooth shifts but where they excel is in stop-go traffic. The price is the big highlight and comfort in bumper to bumper traffic is what you get. The shifts are jerky and slow but a certain level of improvement over the past gearboxes of Maruti can be seen. You have to plan overtakes and understand the gearbox if you have an enthusiastic pace. Manual mode is there if you are in serious hurry or if you are on a twisty road and want to enjoy it. Once you get things right, the performance is brisk and car takes of the line with an urgency you expect in this car. NVH level are great, but engine sound can creep at times which can get disturbing. We were getting 16.5 km/l in the city and 20 km/l on the highway. The car rides on 15-inch wheels and tyres are eco friendly units from Bridgestone. The car has a high ground clearance of 180 mm and it helps provide great ride quality and go over bumps at speed at the same time which is a great feature in the monsoons as the roads deteriorate rather quickly. Steering isn’t extremely communicative but it is light in the city and makes it an ideal car to nip in and out of traffic. Body roll is bare minimum and car is planted at all speeds and in sweepers and corners. Brakes are bit spongy at slow speeds due to the AMT gearbox which sends the torque with a bit of delay but there is always enough stopping power to bring you to halt safely. Car does come with ABS and EBD as standard on all variants. It is a fun little car to drive and there is no denying it. Nobody ever thought the Ignis could ever make it into our conservative and picky car market. Maruti bought the car in the Indian market and rolled it out with whatever it could offer and people are starting to pick it up as well. Sales are quite good for the brand and there is very strong reason for it. Ignis looks great inside and out. The car also offers proven engines with manual and cheap to run and maintain AMT gearboxes which makes it stand out even more. The cosmetic options to make the Ignis look different are also on offer. Customization with the Ignis is at a very high level and so whatever a customer needs, it is right here and then there is no reason to buy one if you are in a market for a vehicle which offers this level of versatility. If only that AWD variant had made to the country, but then that is a story for some other day.